This section is about which components I chose for the server, and why I made those choices. I was going to run FreeNAS on the server since most people seemed to recommend it, but my IMAX Mini (not surprisingly) didn’t comply with the hardware recommendations. So I went for Ubuntu Server 14.04 LTS instead since I already use Ubuntu Desktop 14.04 on my other computers. Debian is another Linux distribution that I considered using. Ubuntu is a lot easier to use though, and I’m not a Linux expert (yet ). 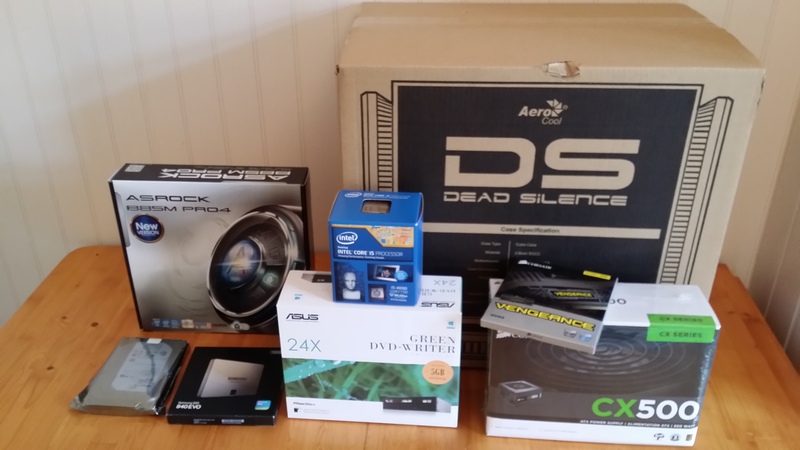 The components for my server, still unpacked. Since I was in a hurry at the time, and had only one local store to chose from, some of the components were not what I might have chosen otherwise. However, I’ll refrain from talking further about that since everything on this list is (very much) good enough. Affects choice of motherboard and CPU. 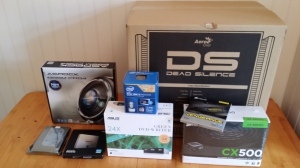 I’m normally more of a Full-Tower guy, preferring to have a chassis and motherboard big enough so that there will never be any question of whether a new component will fit or not. My latest stationary PC is however a Mini-ITX cube, and I like that very much. For my server, I’m not at all sure what I might to want to install in the future, so I went one size bigger – micro-ATX. Affects choice of CPU (duh…) and motherboard. In the beginning I only used Intel CPUs. Then I only used AMD CPUs for many years. Nowadays I just don’t care – they are both good enough for me. I think I have had Intel CPUs in most computers for a while now, but that’s just happenstance. For this server I picked Intel’s Socket 1150 (also known as LGA 1150 and Socket H3) for no better reason than that’s what the computer store had the best choices for in stock. Decision: Separate GPU or on-board graphics? Affects choice of GPU (Graphics Processing Unit), i.e. to have one or not, but also the choice of motherboard and CPU. This will be a server, not a gaming machine. Ubuntu Server doesn’t even have X (the graphical interface) installed by default, and I have no intention of adding it. The server will not even be connected to a monitor – I’ll be administrating it remotely. This means that even the simplest of on-board graphics will be good enough for this server. For on-board graphics to work, both the CPU and the motherboard need to support it. Most of them do (it’s actually hard to find one that doesn’t), but you should still make sure if that is the way you want to go. I had already decided on the form factor, microATX. I also new that I wanted a relatively small and compact chassis, and it needed to be silent since I intend to have it in my bedroom. I didn’t really care about how it looked, but I ended up with a really nice looking case. The AeroCool DS Cube Window chassis looks really great. It’s a bit bigger than would have wanted, but that doesn’t really matter since I will be able to place it just about anywhere. The store only had one of them left, and I feel really lucky that it was the orange/black model – partly because it’s the Ubuntu color, and partly because I just like it. The “DS” is for Dead Silent, and that’s seems to be close to the truth. I can hear my server, but that’s just the replacement cooling fan in the front that I put in – can’t really blame the chassis for that one. “Window” only means that this model has a window in one of the side panels so you can see inside. Some people like that. To me it’s of no consequence whatsoever. What’s most important to me is that it’s easy to work with, and that it is. What I wanted was a microATX board, with Socket 1150 and an Gigabit Ethernet card. The store had ten or so models that fit the criteria, and I chose the second cheapest, which had more USB connectors than the cheapest one, and could handle Dual Channel (see About the RAM below). DDR3 cards is what the motherboard wants, and 1600 MHz is the fastest it can run them at. There are web sites for checking if a specific memory model will work on a specific motherboard, but my choices were limited and so was my patience, so I just picked a couple; They work fine. This motherboard supports dual channel access for the memory. That basically means that if you put two identical memory cards on the board, it can read (and write) both at the same time on separate channels. In simplified theory making my two 4GB cards twice as fast as if I had used a single 8GB card. It’s not quite that simple in reality, but it is much faster. I don’t really have any immediate use for a DVD reader or writer. I simply realized that I don’t have one in any of my other computers anymore, so I figured I’d buy the cheapest one that I could find and put it in the server – just to have one in case I ever need it. The motherboard came with a DVD full of drivers and other stuff (as did some other components), but that’s just for Windows, so had no use for it on my Ubuntu Linux server. I wanted an SSD (Solid State Drive) for the system, and I like the Samsung 840 EVO Series (I have several of different sizes). 120 GB is actually over-overkill for an Ubuntu Server system, but I got a good price on that one. I don’t intend to store a lot of stuff on the server (I have a separate NAS for that), but I will be running a Transmission BitTorrent daemon on it, and store whatever I download locally while downloading (before it is moved to the NAS). I don’t know how many write-operations to the same sector that a modern SSD can handle, but feel safer using an old-fashioned mechanical for those large temporary files. So, I added a 1 TB HDD to the list. In hind-sight I realize that I should have at least checked the reviews to find a silent model, but if it’s noisy I can always spin it down during the nights So, not much thought behind this choice – I just picked the first in the stock list.